The summer is underway, and so are most people’s golf games. Like the weather so far this spring and summer, the condition of your swing may not be the best you have seen. From a golf fitness and biomechanical perspective, I talk to my patients and clients a lot about maintaining posture throughout the golf swing. This mostly refers to maintaining the spine angle from your set-up position through just after impact. Maintaining posture helps with both consistency of ball striking, as well as power production. One of the common problem areas that I see is loss of posture in the upper body, which Titleist Performance Institute terms, “Flat Shoulder Plane”. This swing fault is characterized by a more horizontal turn of the shoulders in the backswing, compared to the original spine angle in the set-up. This causes a change in the spine angle on the downswing, which can reduce the efficiency of the motion. I want to highlight a few common physical causes that may lead to a flat shoulder plane. One factor is a “C-Posture”, or rounded upper back, at the set-up position. This flexed position causes the upper back to be at a disadvantage to rotate, already hindering your ability to have a full shoulder turn before you even start your swing. Check your posture from the side, using a mirror, to look at your spine angle at address. Another physical cause for a flat shoulder plane is a lack of thoracic spine (mid-upper back) rotation. If your mid-upper back does not have the ability to fully rotate, then the tendency is to lift out of posture and compensate with unwanted movements from the low back or shoulders. A third factor that may contribute to a flat shoulder plane is a flexibility restriction through a big muscle in the torso called the latissiumus dorsi (a.k.a “the lat”). 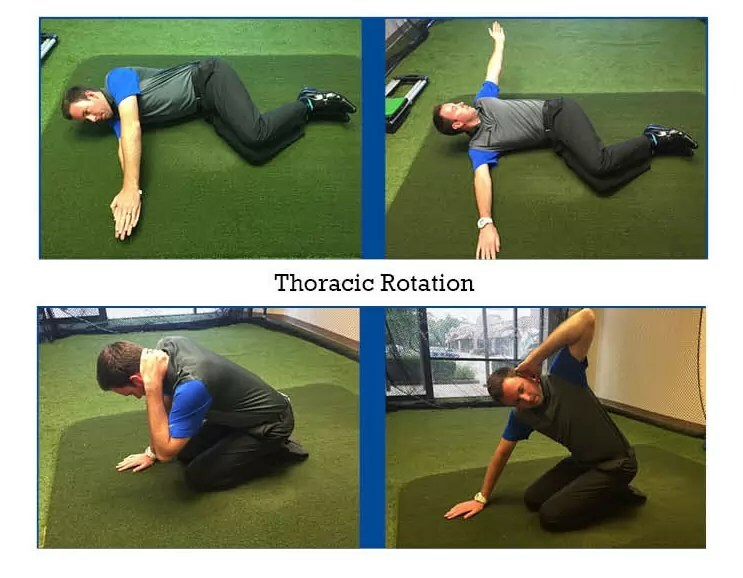 Although this is a big power muscle for the golf swing, tightness in this muscle may lead to loss of posture any time the arms are elevated or rotating, such as in the backswing. If you tend to come out of posture in your upper body, try and improve your set-up posture, your thoracic rotation, and your lat flexibility. You may see better ball striking and more distance. You can also contact Athletico’s Golf Performance Center in Oak Brook at 630-572-9700 for an individual biomechanical evaluation for further assessment. Today’s blog post is written by guest blogger Joe Estes, PT, DPT, CGFI. Joe is a physical therapist and Certified Golf Fitness Instructor at Athletico’s Golf Performance Center. This entry was posted in Articles, Athletico, Golf, Performance, Sports, Training by sportsmedicineweekly. Bookmark the permalink.